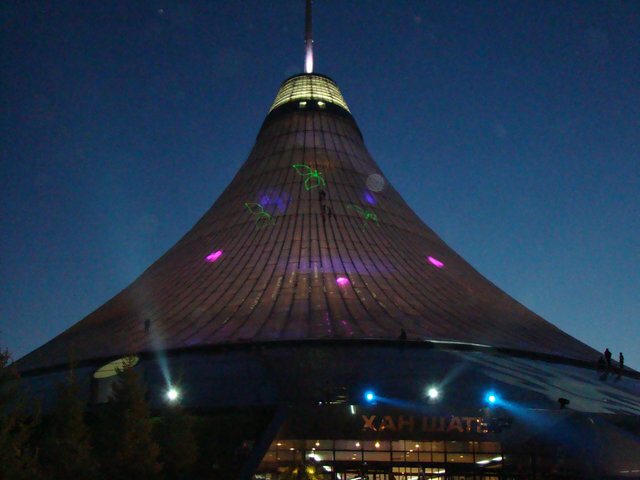 On 7 July, the Firm "Techart" staged a laser show during the opening of the Khan's pavilion, a great entertainment center in the Kazakh capital Astana. The opening of the Khan's Tent was timed to two dates to the 13 th anniversary of the city and the 70 anniversary of the President of the country Nursultan Nazarbayev, the decision by the capital of Kazakhstan was moved from Almaty in the ancient oasis of Sary-ARKA. In the Tent on multiple levels, numerous shops, restaurants, cinemas, a sports complex and a wave pool, a river and a waterfall. Inside the Tent will be kept at a constant climate. In the laser show at the opening of the Khan's Tent had been involved three laser systems, and the 150-meter high Tent has become a screen for laser graphics. For several years the firm "Techart" holds a laser show at the festival "Republic Z" (Kazantip). This year the festival involves 8 lasers on stage and 8 on site. At a meeting held on 7 August, the opening of the festival were 16 laser devices. Laser show festival "Otrokiv 2009"